Christina Britt Lewis, the co-founder of The Redesign Co. in Davidson, has learned how to live well and spend less. “We discovered that you don’t need much to make a beautiful life,” she said. The Redesign Co. specializes in uniting lifestyle with a contemporary design aesthetic. The results are cool and refreshing. It’s possible to update one’s home and lifestyle without tossing out all of the old, Lewis says. Leather and neutral upholstered furniture tends to be timeless, she says. “Fresh toss pillows breathe new life into an old sofa. A cozy throw blanket hides all sorts of wear and tear on an old chair. The more worn and lived-in the leather, the better. 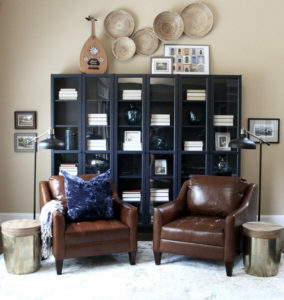 Solid wood tables, chairs, cabinets, and bookshelves stand the test of time as well. A super cool new lamp on an old wood end table creates a fun juxtaposition. Collections of your favorite books, objects you have collected on your travels, natural elements you find walking on the beach, pottery handmade by your little ones… all of these things make old bookshelves feel important and beautiful. Fresh paint makes dated wood furniture feel new again,” Lewis says. But what about traditional dining sets? “You can’t give a traditional dining set away these days,” Lewis says, explaining that “matchy-matchy” is no longer desirable. “But you do not need all new everything to have a beautiful home. You can make that matching old dining room set Grandma gave you feel all “Anthro” in a weekend,” Lewis says. 1. Keep the dining table just the way it was at Grandma’s house. Respect. 2. Paint the chairs a color that you love. Navy is everything right now and complements most “traditional” wood tones. Annie Sloan chalk paint makes the task of painting old furniture super easy, no need to sand. We love “Napoleonic Blue” with a dark wax finish. 3. Replace the end chairs with something updated and comfortable. We love a slipcovered Parson’s chair in a neutral fabric. 4. Add a couple of happy toss pillows to your new end chairs in a fun print. 5. Paint the china cabinet or buffet the same as the chairs or white. White is classic and fresh. 6. Add some real plants in pretty pots or baskets to the center of the table and a candle or two for coziness. 7. Order takeout, turn on good tunes, light the candles, happy home. I take it “re-use” is about repurposing vintage industrial items. How do you get a professional look when you’re done?